Entrant Company: IW Group Inc. The Situation: The Dragon Boat online campaign focused on Chinese Americans, who migrated to the US to provide a better future for themselves and their families. In order to fulfill their aspirations, they realized the need to prepare for the future in every way, especially financially. However, when it came to choosing a strong, trustworthy, financial partner, they faced language and cultural barriers. From an industry standpoint, consumers also faced several choices, with strong competition in the market place. To build a strong market position with its multicultural customers and consequently grow its market share, the Dragon Boat banner was the first online gaming banner in the Asian market with Facebook integration. It successfully integrated culture, online gaming and social media and transformed the web experience of the consumer by going beyond traditional product information, and instead, providing consumer engagement with the brand. The Dragon Boat campaign creatively responded to the consumers’ needs by, i. Focusing on strong cultural insights (a 2,000 year old sport - the Dragon boat race, which requires strong teamwork, strategy & synchronicity; and Snoopy - strongly identifiable by Chinese American consumers); and ii. Grabbing the attention of, and maximizing MetLife’s brand exposure for the typical online audience, with a short attention span, to reinforce the message of being the #1 Life insurer in the U.S. Insight and Strategic Approach: According to the 2009 AM/ISA Asian American Market Report 69% of Chinese Americans have internet access at home and 55% at work. Their online activities range from browsing in-language news sites (86%) from their home country, to email (93%). Other online activities include social media networking and online shopping. With these statistics, online media was a medium that could not be ignored, and it was imperative to not only be a visible brand online, but also drive traffic to the MetLife website where potential consumers could scroll for more information on financial products, find an agent, or simply calculate the amount of coverage needed. By acknowledging an increasing trend of Asian Americans reading news online, the focus of media selection was major in-language newspaper sites that have a strong and loyal audience base from their respective print editions. The selection was designed to increase exposure by reaching and retaining the tech savvy online readers. Placement of the game banners on in-language news sites was critical for high visibility and consumer engagement. 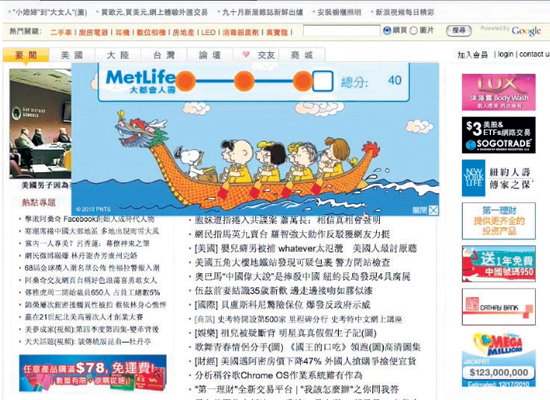 These banners allowed the user to play an abbreviated version of the Dragon Boat game with the option to post their score on Facebook, or go to the MetLife website to play the extended version. The user could play the game several times to better their score, thus increasing brand exposure. The innovation lay in transcending traditional online media and merging it with social networking (Facebook), and the brand website. The Facebook page became an asset as it built a considerable fan base within a short period of time and had the potential to go viral, thus extending the life of the campaign. The MetLife Dragon Boat game over-delivered in several key areas and the following 3 reasons explain how and why this campaign can be used as a template for world class standards. I. Strong emotional connectivity – This campaign was developed to connect a financial corporation with Chinese American immigrants in a culturally relevant way. Knowing that Asians have a high affinity for social media and online gaming, and the fact that they remain strongly rooted in their culture, the creative campaign offered a mix of both. The brand connected deeply with the consumers on an emotional level (rather than on a rational level) with the instant recognition of the dragon boat race, and by giving the consumer control over rowing the boat to victory, it delivered MetLife’s key message of being the number 1 insurer. Strong emotional connection was key to the success of this game, as was evident by the high click through rates and higher levels of interaction. II. Extended brand exposure – The in-banner gaming engagement provided extended brand exposure, compared to a static banner or a product specific rich media banner. The fact that they were floating banners also increased the chances of consumer interaction, as news sites (on which these banners were placed) could not be accessed unless the banner was clicked. The creative and media strategy together, contributed towards an interaction rate that was 4.5 times higher than industry standards with this particular campaign. This is significant because greater brand exposure means higher brand recall and favorability. III. Continuous viral growth - Despite limited media budget and a brief campaign, the brand game grows virally throughout social media via Facebook. Facebook continues to drive traffic organically to the MetLife home page for consumers to interact with the game (and the brand) and post/ share their scores. It also provides MetLife with a growing database of potential consumers to communicate with, in the future. I. A total of 50,293 clicks were acquired @$0.46 per click.